Hey guys! Hope all is well and welcome to my five theatre shows to watch in the UK list for this December! I am one to love theatre shows. I find them insanely fascinating. As an acting student, I know what it feels like to stand in front of a crowd and I know how scary it can be sometimes, so I find it an insanely brave career to take. I am always amazed when I go and watch one but I actually haven't been in awhile, so I'd really like to go this month or sometime in the year coming ahead. For now, I'll list those I've gone to watch and those I wish to watch down below. Let me know if you do go and watch one and how you felt about it, so enjoy! I haven't gone to watch this yet and to be honest, I'm not in a rush to watch it. I have watched the movie and although it's a Christmas movie a lot of people overly enjoy, it wouldn't be one of my first choices. I do want to watch this one day though but it isn't on the top of my list! I have planned to take my little god brother to watch it next Christmas though as I haven't had enough time to plan it this year. But if you do decide to go watch it, do let me know what it was like for you. It's being showcased at the Noel Coward Theatre from the 30th of November to the 30th of January and I'll leave a link down below as to where you can buy tickets at. I love musicals SO much! And this is definitely one I really want to watch. Like I said above I haven't had time to organise a theatre trip this winter but I do intend to do a lot of theatre visiting within the next year and there's always next December if anything! I love the movie so much so I can only imagine how much I could love the show and not to mention they'll be a lot of singing too! AHHH! I can't wait. Showcased at the Dominion Theatre from the 24th of October to the 2nd of January and the tickets are super inexpensive at the moment so I'll leave that linked below for you. I went to watch this show a couple of years back with my best friend Patricia, her mother and her sister and also with my mother and sister and it was by far the cutest show I have ever gone to see. It was so emotional and so Christmassy and magical, basically, in other words it was brilliant. Its such an amazing show to go and watch with family and little children, believe me, you will not regret it. The songs and representation of the movie were so good and it also stayed true to the storyline which I found really fascinating too. So do find time to go and watch this over at the Peacock Theatre! It's on from the 25th of November to the 3rd of January. I think this would honestly be the most magical thing I could ever go and watch, so yes it is on my to-do list for this year if time is made but if not its on my definitely must do list for next year. A show on Ice, I can't believe I haven't ever been to see one! I can't really recommend those that I haven't been to see so I'm just sharing what I would like to see and this is one of them, just like the first two as well. I can't give details but as a little girl, I used to love the Barbie version of the Nutcracker and so I can only imagine how beautiful this piece would look. They also have a normal performance of the Nutcracker at the Royal Opera house, showing from the 8th of December to the 3rd of January. 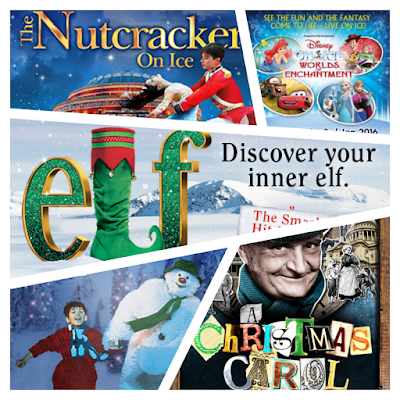 However The Nutcracker on Ice is showing at the Royal Albert Hall for a limited time only, 28th of December to the 2nd of January, so make sure to get your tickets now. OH MY GOSH! DISNEY ON ICE! I have been wanting to go for years and years! It would honestly be like a dream come true so this is most definitely on my next year must do list! I would love for someone to tell me all about it as I could sit and listen to you for hours! Yes, yes, I am a huge Disney fan! It only comes out once every year also for a limited amount of time. This year it's showing at the 02 arena from the 22nd of December until the 3rd of January.